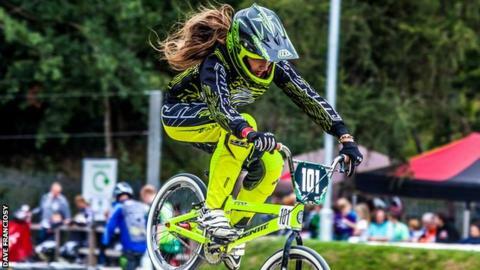 Great Britain BMX rider Charlotte Green says racing alongside world champion Liam Phillips has helped make her a better rider. The 19-year-old from Cornwall races in her second Supercross World Cup event in Papendel in the Netherlands alongside Phillips this weekend. "You can learn a lot from Liam, he's worked really hard for where he is," Green told BBC Radio Cornwall. "It's really good to have someone like that who you can really look up to." Green, who began riding at the age of four after copying her then seven-year-old brother, made her British debut in the last month, finishing fourth. "The biggest thing I got from that would be confidence and believing in myself," Green said. "It got me to the final so hopefully more of that and I can make the final in Papendal as well. "There's going to be more or less the same girls there so it's going to be just as hard. "It's a great feeling to represent your country because you know people back home are there supporting you and watching you."